A musical perfectionist with a love of misinformation, Jack White famously doesn't take to being given direction. But the American singer-songwriter, producer, and cultural entrepreneur makes an exception for his orphan songs - the tracks that he considers and cuts from successive albums until they find a home. "They can tell me what to do," says White. The former White Stripes frontman's most recent orphan was a song titled Shine the Light on Me, which White had previously weighed up including on his last two solo albums, 2014's Lazaretto and 2018's Boarding House Reach. What the unreleased tune needed, White realised, was the Saboteurs, the alternative-rock band he'd co-founded in 2006 as gaps grew in the White Stripes schedule. The group hadn't worked together since touring in 2011, but maybe they were also what White himself needed. "We were hanging out a little bit and decided to record two or three things to see what it was like, maybe put out a single," White remembers, "and it came together strong and fast so then we wondered what it would be like to play a gig together." What began in private in the band's hometown of Nashville at the close of last year is about to go public. The Saboteurs - the band is known as the Raconteurs in the rest of the world, but the name was already taken here by a Queensland jazz band - have finished recording their third album, Help Us Stranger, their first in over a decade, to be released June 21. They're introducing the revived group and new material with a trio of Australian shows. "Everything is different and everyone in the band is different. There's so much experience now, you can just tell how much every musician in the band brings to a song," White says. "It's so different than when we were jamming with other line-ups at 25. It's so interesting to play with people who've been playing for so long." It's five in the afternoon in Nashville and White is speaking after a day in the rehearsal room with fellow songwriter and vocalist/guitarist Brendan Benson, bassist Jack Lawrence, and drummer Patrick Keeler. Waves of excitement, amplified from a day spent laughing as they mastered old tracks and broke down new ones, surge through White, while there's a hoarse edge to his voice from belting out vocals. He sounds worn but vibrant, like the delta blues greats who changed his perception of music as a teenager. "So much of the [Saboteurs] is me and Brendan Benson writing songs together, and with this album the entire band produced it, not just Brendan and I. It was very collaborative and driven by what the four of us could make together," White says. "That's totally different from when I'm making a record by myself and there's no one around to bounce ideas off except the person looking back at you from the mirror." From guitar solos to stage outfits, White has exacting standards, but he's also been committed to collaboration since his first wife Meg White began drumming on his songs in the attic of their Detroit home in 1997 and they formed the White Stripes. 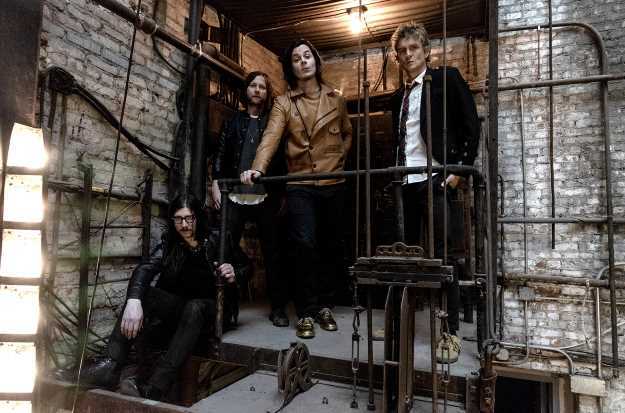 Both the Saboteurs and White's other band the Dead Weather, which also features Lawrence and is fronted by the Kills vocalist Alison Mosshart, have given him what he calls "a good bedside manner". "You can't be too spoiled or too stubborn when you work with other people. There has to be give and take and you have to carefully pick your battles," White says. "You already trust these people, and they trust you, and you're already working together so sometimes you're right and sometimes you're wrong." Nonetheless the 43-year-old father-of-two casts a considerable shadow. The two-piece garage-rock blast of the White Stripes, which White insisted was a brother and sister group, exploded into alternative rock stardom; the central riff from the duo's 2003 hit single Seven Nation Army is a signature sound of the 21st century. Since the dissolution of the White Stripes he's had a trio of number one solo albums in America and stood next to a helmeted Daft Punk at Jay-Z's 2015 launch of the music streaming service Tidal. In the video for Sunday Driver, the propulsive first taste of the Saboteurs' new material, White delivers galvanising licks on a gold-plated Gibson Les Paul flying V guitar known as a "Fort Knox". The manufacturer gave it to White for free, which is indicative, along with the feature film documentaries and New Yorker profile, of how feted he is. But as the youngest of 10 children, White's rarely, if ever, been diverted from a considerable work ethic, putting out or producing one or more albums a year and touring extensively. "It's a matter of keeping things in perspective. For a start there's children, family and friends, and everything else is one of those momentary nice things that you work towards," White says. "If you work hard and you're passionate once in a while something nice will happen, but you just have keep it in moderation because if you over-indulge in anything you lose track of your long-term ideas." White's interests are now legion. In Nashville tomorrow The Saboteurs make their official return to the stage by headlining the 10th anniversary celebration of Third Man Records, White's commercially successful independent record label and vinyl pressing plant that's released over 600 new and previously out of issue albums. The staff wear yellow and black uniforms conceived by White, whose interest in transforming expectations - or dictating terms - now extends to a policy of having screen-free gigs. At the Saboteurs headline Australian shows devices are secured in a pouch prior to entry, with a designated area outside for those who need to check them mid-gig. White cites churches, courts and cinemas as places where smart phones are kept pocketed, and after a test run on the road last year he believes gigs should be the same. "We thought it would be a letdown, but people loved it to death," White says. "More and more bands are picking this up and everyone in Australia will be really surprised. People might not like the music, but they'll like the experience." The Saboteurs play the Regent Theatre in Melbourne on Thursday, April 18; Luna Park Big Top, Milsons Point in Sydney, on Saturday, April 20; and Bluesfest at Byron Bay on Sunday, April 21.